Click here for latest winner results and Ranka Online’s full coverage. At 9 pm EST (6p PST) Tuesday night, Michael Redmond 9P and E-Journal Managing Editor Chris Garlock will provide live audio commentary on KGS on the top boards at in the Pair Go competition. 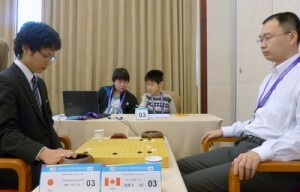 Men’s team tournament (fifth round): Korea 2-1 over China: Park Jeonghwan beat Fan Tingyu (Redmond Commentary), Cho Hanseung beat Wang Xi; Zhou Ruiyang beat Kim Jiseok; Chinese Taipei 2-1 over Europe: Chou Chun-hsun beat Fan Hui, Ilya Shikshin beat Wang Yuan-jyun, Lin Chun-yen beat Pavol Lisy; Japan 2-1 over North America: Fujita Akihiko beat Huiren Yang, Hirata Tomoya beat Daniel Daehyuk Ko, Yongfei Ge (right) beat Tsuruta Kazushi. 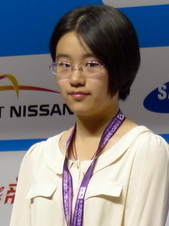 Women’s individual tournament (seventh round): Yu Zhiying (China) beat Wang Chenxing (China) (Redmond Commentary).